Twin-stick shooter supports 4K at 60 frames on Xbox One X. Assault Android Cactus will launch for Xbox One on November 7 for $14.99, developer Witch Beam announced. The arcade-style twin-stick shooter first launched for PC, Mac, and Linux in September 2015, followed by PlayStation 4 in March 2016. The Xbox One version will support native 4K resolution at 60 frames per second on Xbox One X, and include optional developer commentary. A free 30-minute trial of the game will also be available. Assault Android Cactus replaces the traditional life system with a continuously draining battery. Players will need to make every second count as they maneuver through endless swarms of relentless robots to grab power-ups and all-important batteries from fallen enemies. The only way to survive is to keep fighting. Each of the nine vibrant android heroines has their own character-specific primary weapon with infinite ammo and a more powerful secondary weapon with a cooldown timer. Knowing when to switch between the two is the difference between victory and defeat on ever-changing stages. 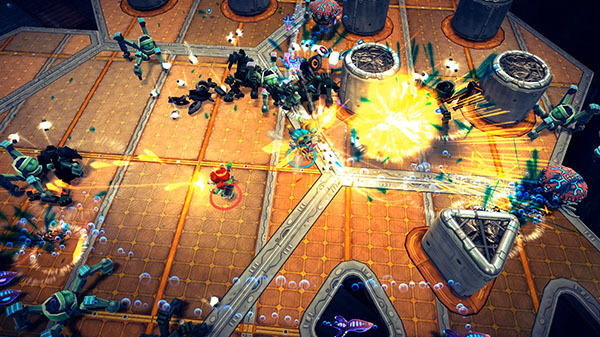 Accessible gameplay makes Assault Android Cactus an intuitive title for one to four people to pick up and play. A variety of game modes put the androids’ skills to the test. Infinity Drive throws out wave after wave of mechanical minions. Rumble with the big boys with the Boss Rush mode or drop by the Daily Drive to challenge a new scenario every day. Unlock EX options that open up a first-person perspective, powerful MEGA weapons, or an A.I. partner to bring along for the ride. Follow Junior Constable Cactus and her friends across 25 action-packed levels as they regain control of the Genki Star space freighter from robot workers running amok. Lasers will fly as androids dodge bullets and send five bosses back to the scrap heap, all before their batteries drain away. Watch the Xbox One announcement trailer below.